For a while now I have been looking for a good way express the Steampunk aesthetic, but the words have failed me, which is a hard thing for me to admit. I am rarely at a loss for words, but this current wave of retro- and paleo-futurism has inspired me. As I continue working on Fate's Harrow and Phara-un, I have been trying to incorporate as much as can into the tales. 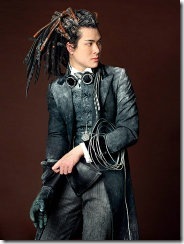 I am happy to say that I have found a project that will allow me to explore the limits of steampunk and beyond. As the images keep rolling in, my imagination becomes more inflamed by these bazaar cross pollination. I am hunting for the limits of cross genre fiction, and as yet, I don't think I have found them. Hopefully, you will enjoy the fruits of these experiments in baroque imagery. I cannot wait to share with you the new tales.